Trump tower is one the best architecturally design you can ever imagine in the world, it was designed by Der Scutt. The magnificient 68-story mixed-use skyscraper is located on 721 Fifth Avenue in Midtown Manhattan, 10022, New York City. It is owned by a man who sure knows how to slice his onions Donald Trump, the 2016 president-elect of United States Of America. The building construction started in 1979 and was completed in 1983. Here are more other facts about Trump tower you never knew. 2. Tower was constructed on the former site of the Bonwit Teller flagship store, an architecturally renowned building that was built in 1929. 5. The tower floors 30 through 68 and are considered one of the world’s elite luxury residences, catering to public figures, athletes, celebrities and other affluent sophisticates. 6. Donald Trump daughter Ivanka Trump Fine Jewelry Boutique is located just inside on the ground floor. 7. The tower is originally the tallest all glass structure in Manhattan. 9. A woman Barbara Res was the construction executive. At that time she was one of the only women who had been assigned to oversee a major New York City construction site. 10. 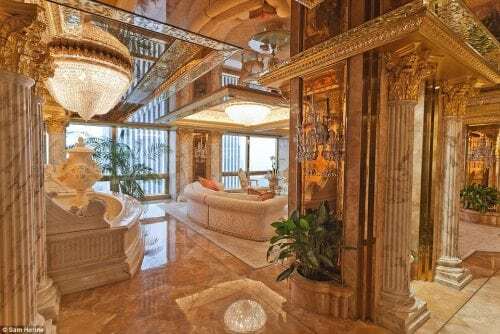 Donald Trump lives in the top floors of his tower hidden behind a grand entryway gilded in gold and diamonds. 11. The residential units were more successful, and 95% of the condominiums were sold in the first four months after it opened, despite their high prices. 12. Trump Tower was constructed on the former site of the Bonwit Teller flagship store. 13. The Tower is one of New York’s most visited attractions since its completion in 1983. 14. The tower has housed celebrities such as late Michael Jackson, Johnny Carson, Andrew Lloyd Webber, late Liberace and so on.